After a full day of watching the Inauguration coverage, I am pretty well-versed in the details (although I'm still waiting for the photo from space that Wolf Blitzer keeps promising). I loved all of the pomp and patriotic tradition, but true to form, I was most interested in all of the details of the Congressional Luncheon. A little research on the official luncheon website revealed a surprising amount of detail. 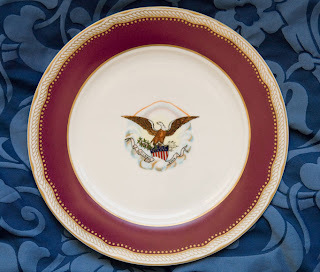 The meal was served on a reproduction version of the Lincoln china (above). 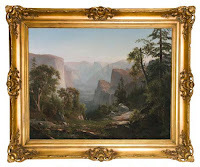 There was also a special painting borrowed from the New York Historical Society- "View of the Yosemite Valley," by Thomas Hill, which served as a backdrop to the head table. The painting is meant to represent the "dawn of a new era" and also is an allusion to Lincoln's signing of the Yosemite Grant, which made the valley a public reserve. 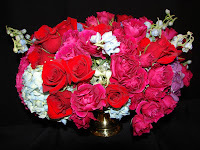 The site also revealed what the floral arrangements looked like- pretty much what you might expect, if you ask me, what with the red, white and blue.